Day 1 Sat 11 nm Kos, leaving kos marina for Pserimos anchorage (or Kalymos/Vathi port on Kalymnos). Day 2 Sun 21 nm Leros, Leros Lakki or Ay marina. Day 3 Mon 43 nm Cross towards Astypalea, long day sailing. Day 4 Tue 38 nm Palon or Mandraki port on Nisyros (visit the fumaroles) - another real crossing. Day 5 Wed 18 nm Tilos, off the beaten track. Day 6 Thu 35 nm Symi, visit Symi port as well as the anchorages south of Pethi. Day 7 Fri 56 nm Kos, explore town and castle. A similar idea is to sail Kos - Leros - Astypalaia - Tilos - Symi - Nisyros - Kos (11, 21, 43, 53, 35, 38, 23 = 224 nm). Day 1 Sat 15 nm Leaving Kos marina for Kalymnos/Vathi port on Kalymnos island (or Pserimos anchorage). Day 3 Mon 19 nm Agathonisi - also known as Gaidaros (Donkey), since seemingly shaped like one. Visit Agios Georgios port. 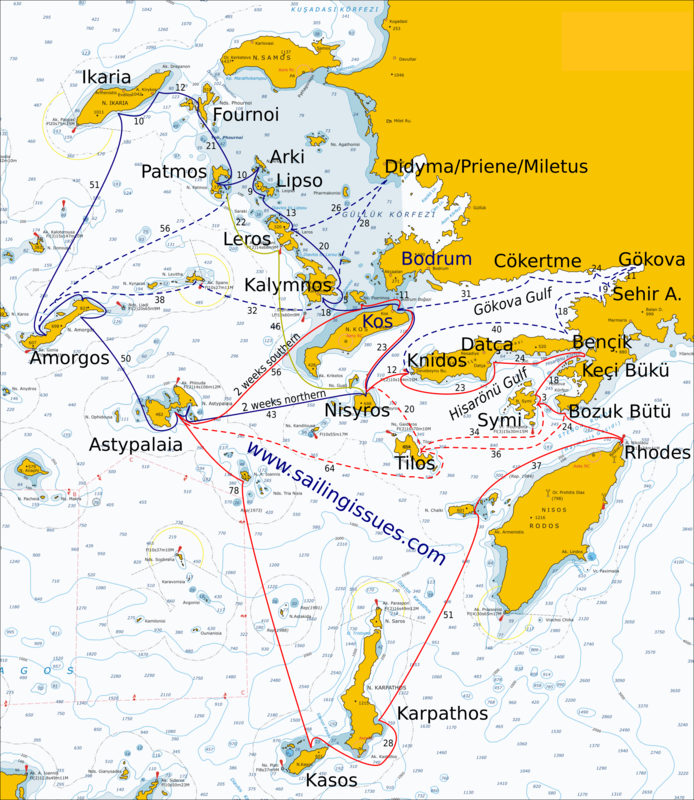 Day 4 Tue 23 nm Arki - Marathos (Marathi) islet and Augusta port (13 nm) - and Patmos island - Skala port (a further 10 nm). Day 6 Thu 35 nm Past the west cape of Kos island to Palon or Mandraki port on Nisyros, visit those mephitic fumaroles. Approximate distances in nautical miles. The navy blue line is the Northern route, 2 weeks, usually sailed counter-clockwise. The yellow 2 weeks route is a drastic short-cut: only up to Patmos and instead of crossing to Amorgos or Astypalaia, south via Leros - Lakki, Nisyros, (Symi), Knidos and back to Kos/Bodrum. The red line is the Southern route, 2 weeks, also possible to start at Rhodes or Marmaris, Turkey. Kasos and Karpathos are worth the extra mileage but often substituted for either Amorgos or the Gökova Gulf. The northern route is preferred 2 weeks itinerary and if too long best to skip Ikaria and Fournoi but include Amorgos and Astypalea. Note that the open stretch of water between the Dodecanese and Amorgos/Astypalaia can get very windy. Also because of the long fetch the waves can be much higher here. See stepping stones between Cyclades and Dodecanese. Second best is the southern route 2 week route or the yellow route. Third is the Turquoise coastal route: both the Hirsarönü and Gökova Gulfs with Symi, Nisyros. The farther east – and between the Turkish promontories – the better the shelter (lowest winds/waves). Also much shorter distances between ports/anchorages within the Turkish Gulfs. Also means that there are lots of picturesque ports/ along the Turkish coasts not indicated on this map. To include Amorgos and/or Astypalaia makes for an advanced itinerary! Day 2 Sun 38 nm Nisyros - Palon (more shelter) & Mandraki ports, a visit to the caldera and try to anchor at the many volcanic beaches. Day 3 Mon 31 nm Kalymnos - The main port of Pothia, with its Italianate style of architecture. Anchor at Telendos or much more secluded in Emborios. Day 4 Tue 34 nm Lipsi (Leipsoi) - Churches of Panagia/Virgin Mary and the nearest blue cupola Ioannis Theologos/John Evangelist. Anchorages at the northwest and south - lots of reefs! Day 5 Wed 11 nm Patmos - Rent bikes/scooters from Skala. Day 7 Fri 31 nm Samos - Marathakambos (27 nm) or Pythagorion (31 nm) ports, Pythagorio fortress and the tunnel of Eupalinos. Day 8 Sat 17 nm Agathonisi (Gaidaros) - Ay. Georgiou port and the narrow anchorage 1.3 nm to the east. Day 9 Sun 19 nm Leros - Alindas bay and the Venetian castle, or the more peaceful and lush Pandeli bay further south. Day 10 Mon 23 nm Pserimos - The small hamlet of Pserimos is delightful after the tripperboats have returned elsewhere in the end of the afternoon. Day 11 Tue 11 nm Kos - Kardamena has one of the best beaches in Greece, yet only visit well after the season due to the overwhelming amount of tourists. Normally just visit Kos port and discover the wonderful town. Day 13 Thu 20 nm Chalki (Halki)- The main port Emborio, and the castle on the adjacent island of Alimia (Alimnia). Sailing between the Dodecanese and Turkey. The Wind roses for bareboat vacations in Greece. Luxury crewed yacht charters and gulet motorsailers. Feel free to contact me if you have any questions or if you want to know more about cruising in Greece and reputable yacht charter companies for these one-ways.